You just can’t keep a good woman down, at least not permanently. Canadian artist Franke James was invited to tour Europe to inspire youth with her approach to climate change art. (See Harper Government Trying to Silence Canadian Artist.) In a move reminiscent of the quote often attributed (probably incorrectly) to Queen Victoria, the Canadian government was not amused. With pressure heavy on her Croatian sponsor and embassies backing away as if she were contagious, Franke ended up canceling the tour. Anyone with less backbone might have quietly tucked her tail between her legs and slunk back to the studio. Franke is made of sterner stuff. She has the kind of integrity and grit that are needed to fend off threats to democracy. So she has teamed up with LoudSauce to take her environmental message to Ottawa. Her canvas will be billboards and bus shelters in the nation’s capital. 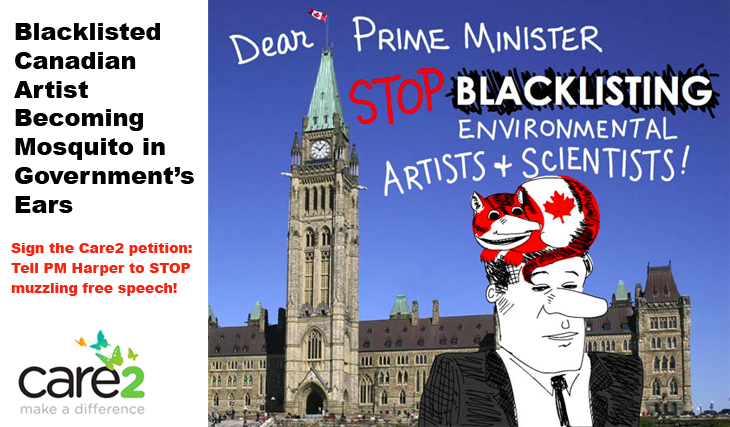 As a new member of “The Harper Blacklisted Club,” she joins other artists and scientists [see Harper’s Humiliating Muzzle on Scientists] whose work has incurred the Conservative government’s displeasure. Fortunately, now there is another way to let the government know they are not the only ones displeased. We can sign the petition below and donate whatever we can to fund the billboard and bus-shelter messages. Let’s help Franke James be the mosquito buzzing in the government’s ears. Make a pledge to support Franke’s Ottawa Billboard with LoudSauce. ©2019 Franke James All Rights Reserved.